6.75 points at 16 votes (rank 418). The home computer conversion does unfortunately not keep exactly to the version of the arcade machine by SEGA, however, the story and aim of the game are the same. The penguin Pengo needs to survive for 120 seconds in an ice labyrinth. To fight against the ice bears (in the original they are named snow bees or ice monsters), there are several methods. First: Crush ice bears with the help of ice blocks. Second: Shatter the game area framing at the border (joystick into the direction of the frame and then press fire button). If ice bears are there, they fall asleep and can be destroyed by picking them up. Third: Push together the 3 diamonds vertically or horizontally, to send all active ice bears to sleep and then collect them. And finally, also the ice bear eggs can be destroyed. Except for defrosting the ice blocks, all actions get you points. The faster the diamonds are brought together and the faster the ice bears are eliminated the highter will the diamond bonus and the round end bonus be. With rising round number the number of ice bears, as well the types of ice bears, that can also defrost ice, gets higher. 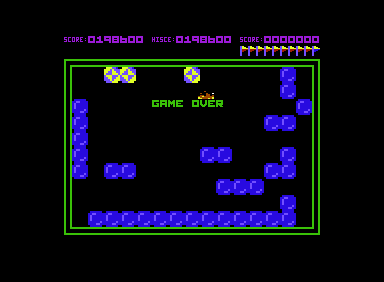 If Pengo is destroyed by the ice bears, the level starts again from the beginning! The game is designed simply with slight animations of the characters. The characters are reather cute. The background music fits the game. Above the game area next to the highscore the following is shown: At the upper left the number of lives in the shape of penguins, in the middle the number of ice bears to destroy for the round bonus in the shape of yellow circles and the flags show the current level. Remember which ice bear you have destroyed. If you have e.g. destroyed the one from the upper left corner, it will reappear there again. 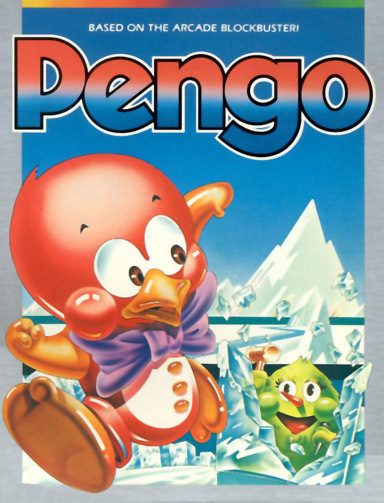 The "Pengo" version by "Nostalgia" offers next to a cheat (unlimited lives) also a saveable highscore list and the option to speed up the game (see critics). The "Petch" version by "Remember" offers next to cheats (unlimited lives, monsters do not awake, invulnerability, jump level), also a saveable highscore. Spaceball: "The absolute classic. The game should not be missing in any serious arcade collection." Jodigi: "Well, I also liked the game. 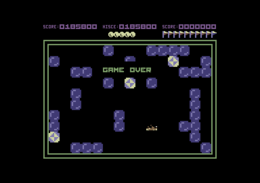 The arcade machine is a bit more tricky and the Atari console version is also rather good, but the C64 version is the funnier one concerning the graphics, alone due to the cutely designed ice bears." Robotron2084: "This conversion is concerning the graphics not really close to the original, but therefore it does look better. Technically everything is fine here and "Popcorn" as background music fits very well! But the game speed!!! ZDF-Fernsehgarten is more exciting! What crossed the programmers' minds to equip the game with the speed of a geriatric grapevine snail, one goes MAD! Fortunately, there is a Speedfix version,which I want to recommend to everyone and for which I give 8 out of 10 points, for the original at hand, however, only 6 points." TheRyk: "Polear bears? Monsters? Excuse my laughter, but the enemies rather look like chicken, in fact even cuter than the player sprite. Once you adjusted yourself to the winter sleep game speed, even this sedate and graphically not really good version can be fun. However, I think the Atari port of this game and various clonse are done better than this C64 version. Real fans should try the clone named Pengon. 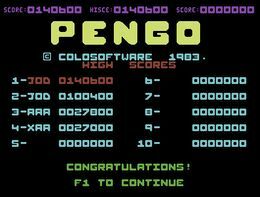 If your are bored and have plenty of time, Pengo is playable enough, though. Generous 6 Points including classic and nostalgia bonuses." Shmendric: "Aha, so these are supposed to be ice bears, so another 20-year old puzzle solved. I simply never could warm to this game, it just provides no attraction. I do not know the speedfix version, maybe this has the necessary pep. Three points, plus one extra for the sound." 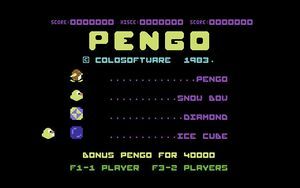 Pengo in the Killer List Of Videogames.